The National Academy of Sciences of Belarus (NAS of Belarus, or NASB) is the highest state scientific organization of the Republic of Belarus. 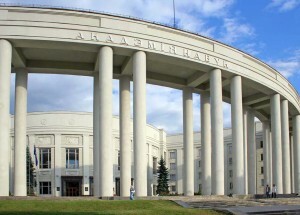 Founded in 1928, the National Academy of Sciences is responsible for organizing, coordinating and performing fundamental and applied research with the purpose of obtaining new knowledge about human, society, nature and artificial objects and increasing the scientific and technical, intellectual and spiritual potential of the Republic of Belarus. The NAS of Belarus unites the highly skilled scientists of different specialties and dozens of research, scientific-production, design and inculcation organizations. At present the National Academy of Sciences has in its organizational structure seven Departments, the NASB staff includes more than 18,000 researchers, technicians and supporting personnel.